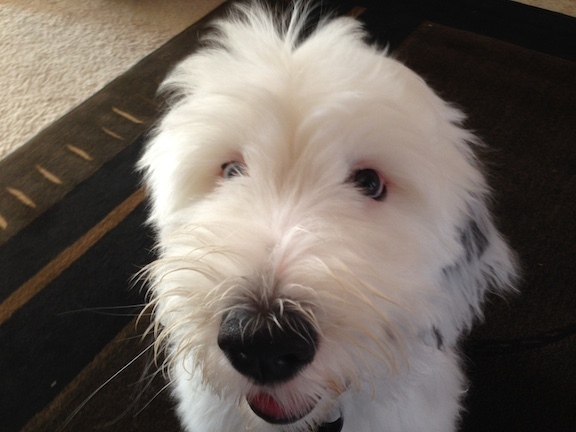 Maya Rose is a three month old English Sheepdog who pulls on the leash, tries to herd guests and her owner’s grandchildren, barks when corrected, chews inappropriate objects, jumps up, pulls on the leash and is overexcited most of the time. Their owner made the mistake of hiring a local “trainer” who practiced dominance theory. When discussing the situation with one of his owners, I was angered to hear that this “trainer” had given them horrendous advice including instructions to place the pup on a prong collar, then violently jerking the leash up while telling he dog “good boy.” If anyone is reading this and you run into anyone who suggests you attempt this or other aggressive techniques, run the other way immediately. When I arrived for the session, I could immediately feel a sense of tension from one of Maya’s owners. Clearly this overexcited pup had some behaviors that were draining and frustrating. Maya’s owners have a nice home and had installed a baby fence with a gate in it to keep the dog in their living room away and from the front door. Because I always want to see how a dog behaves at its worst, I asked her to let her out of the gated area. She was reluctant because Maya had learned how to open the screen door by jumping on it. After she saw I was bracing the door from the outside, she let Maya go. And go Maya did. She rushed the door and jumped up on it so that she was leaning on the glass while looking at me. Maya was clearly excited, but I sensed no aggression whatsoever, so I opened the door just wide enough to insert my body sideways. After getting one half of my body through the door, I paused to let Maya give me a good sniff before fully entering their home. Once inside, Maya jumped up on me a few times until I applied the technique I have developed to stop dogs from jumping up. Maya didn’t like my correction one bit, but after I made it, she started to jump up but stopped herself and did not make contact with me. I showed her guardians the technique and went through the proper times to use it. If they stay with it, her days of jumping up will soon be at an end. When I sat down with the family in the living room, their owner’s daughter was there with her two preteen children. The kids stayed on the other side of the room and were wary of being near the dog due to getting knocked over or nipped when playing with Maya, particularly their 3 year old grandson. I started asking a few questions as I wanted to get a feel for the rules and structure the dog was expected to follow in the home. As it turned out, Maya didn’t really have many rules or boundaries in place. On top of that, her owners petted her when she pawed at them for attention. This is basically the dog giving the human an order to pet them or pay attention. If the human repeatedly pets the dog when it acts this way, they are effectively training the dog to continue engaging in that behavior. Instead I suggested that they start countering the dog’s pawing request for attention with a command of their own. It can be something as simple as asking the dog to sit or lay down. When the dog complies, and we pet the dog after while repeating the command word, we can use positive reinforcement to assume a leadership position to the dog. Next I went through a few leadership and training exercises to help Maya learn to settle down, focus, restrain herself as well as understand the concept of boundaries and limits. Because all of these exercises use positive reinforcement, we can help condition the dog to understand that these actions and behaviors are desired. This is a far better way of working with a dog than aggressive or dominance based techniques like the ignorant trainer had shown the family. After the exercises, I was going through some non verbal communication methods with Maya’s owners when their 3 year old grandchild got up and walked across the room. His mother shot her dad a “can you believe that look,” before telling me that wouldn’t have happened before the session without Maya running over and knocking him down. While that progress was wonderful, what happened next was even better. The 3 year old walked over to where Maya was sitting and started to pet her. His mother informed me that this was the first time that her son had ever petted the dog! By the end of the session Maya was laying on the floor completely calm. Her owner seemed much calmer and relaxed too. When I mention this to her she informed me that they had considered giving up the dog due to all the jumping up, nipping and overexcited behavior. But fortunately when she started to go through the motions of packing Maya’s things up, she just couldn’t do it. Maya is not a bad dog and is certainly not aggressive. However had her owners continued to use the barbaric and cruel techniques the dog “trainer” had suggested, that wouldn’t have been the case. I have worked with many dogs who became aggressive when their owners attempted to use harsh dominance based techniques like the violent jerking of the leash. That’s why its important to seek out a qualified professional when you need help with your dog. Ask questions and avoid anyone who talks about dominating your dog or other things that make you feel uncomfortable. But in this case, the new techniques and exercises that I showed them (that utilized positive reinforcement) had a positive effect on the dog and the humans that live or interacted with her. Based on how much calmer and better mannered she was by the end of the session, it shouldn’t be long before Maya’s unwanted behaviors are nothing but forgotten memories.